Jen Livia and Phyllis Gubins are at it again! I'm honored to be included in their latest show "Full Bloom" which opens this Thursday, July 14th at Red Brick Gallery (www.RedBrickArt.com). In addition to my mobiles, they are featuring several new artists including Illona Aguuayo, Tasia Erickson, Debra Hintz, and Gwenlyn Norton as well as their favorites Joe Cibere, Jim Martin, Stephanie Kiker, Kim Sawyer, Theresa Davis, Dan and Sue Harding. 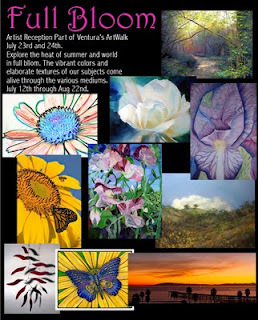 Don't miss their Artist Reception during the all-new Ventura WestSide ArtWalk July 23rd and 24th where they will have several artist demonstrations and live music. For more on the show, please check their website at Red Brick Gallery (www.RedBrickArt.com) and to see more on the new Westside ArtWalk please click their site at www.WestsideArtWalk.org.